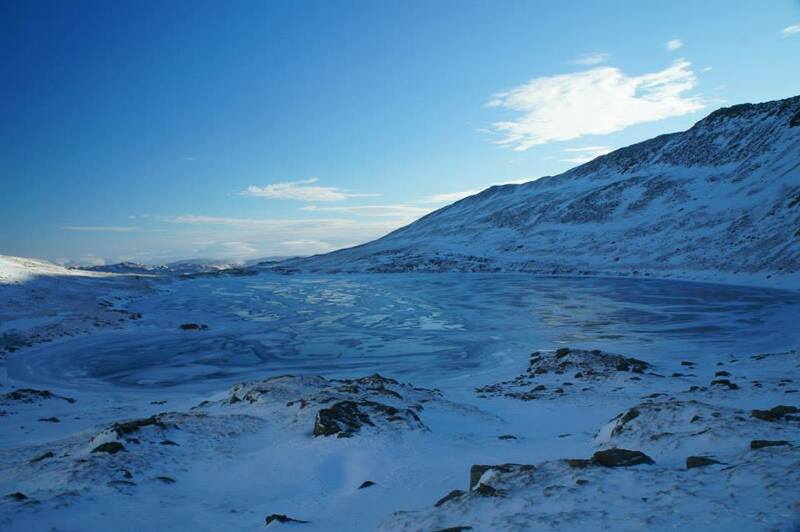 Fine weather and conditions again today on the Red Tarn face. 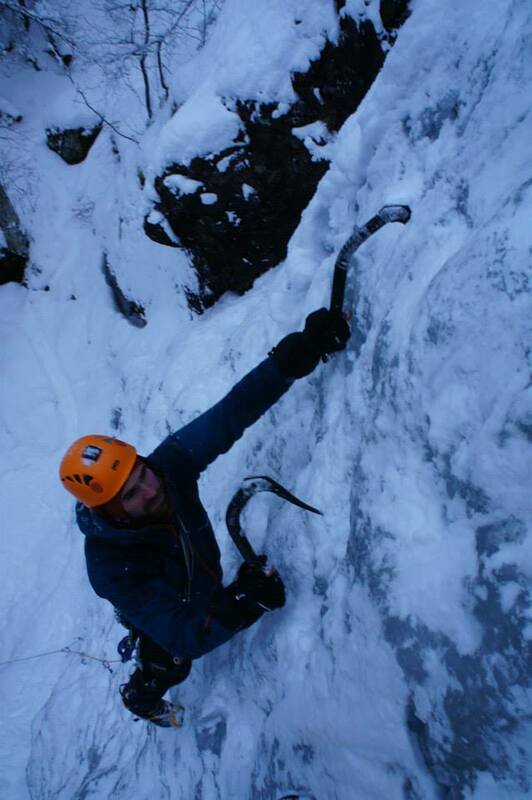 Rob was keen to get the axes out for a day before joining one of our week courses in Scotland this year. 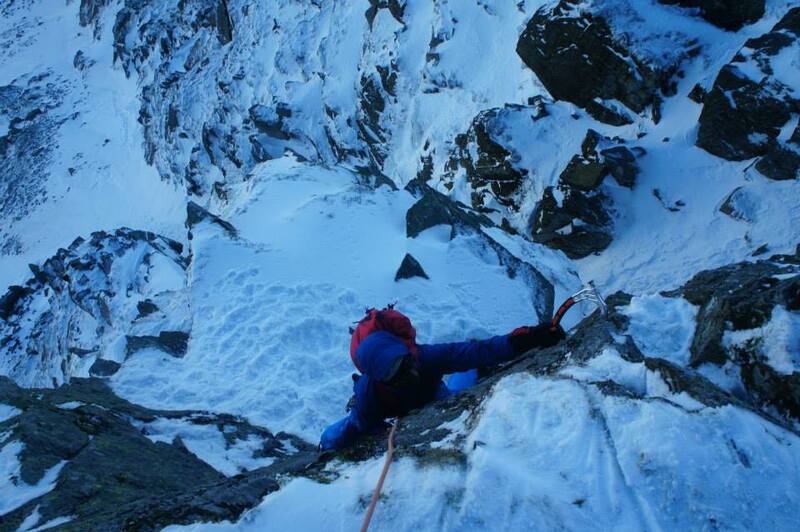 We had a great day on Viking Buttress with the Loki start, the normal route was in great condition still, Thors Corner looked good also, the steeper routes are a bit stripped now. 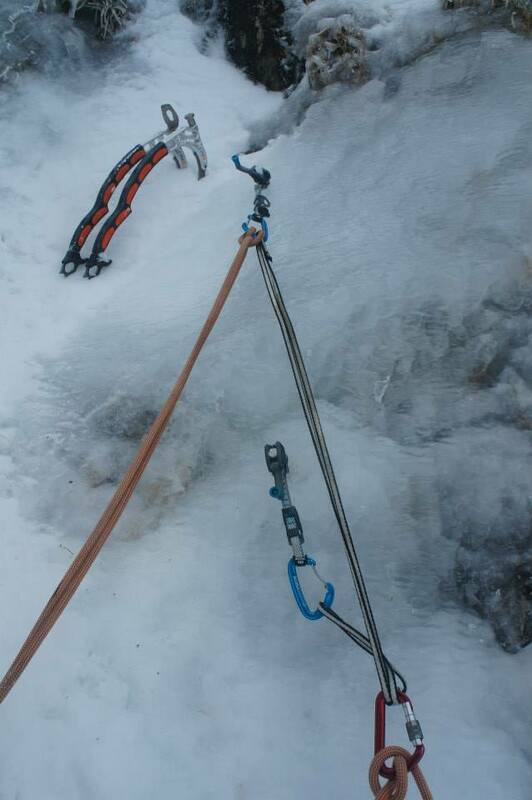 All the gullys and ice variations are looking good. 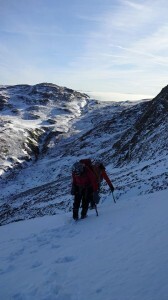 Another brilliant day and 2 weeks without packing a waterproof now! 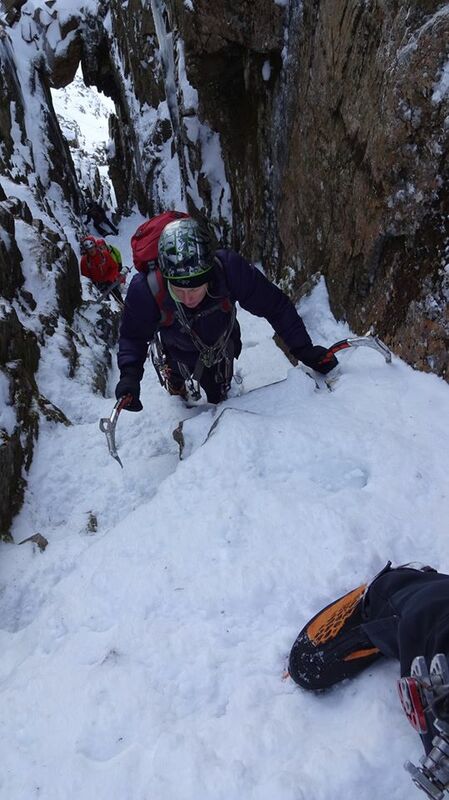 We have just had Juliette and Dave out for 2 days of learning to lead in winter which builds on the range of rock skills they already have. 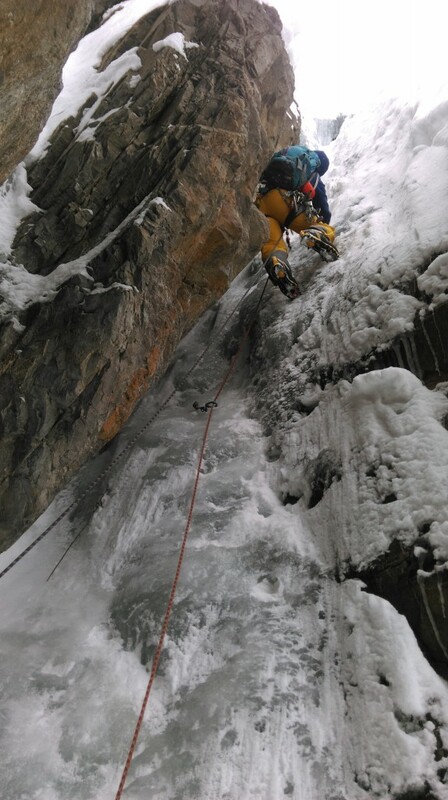 Today was another day of perfect weather and conditions so they headed to Brown Cove Crags with Tom for one of the classic gullys. 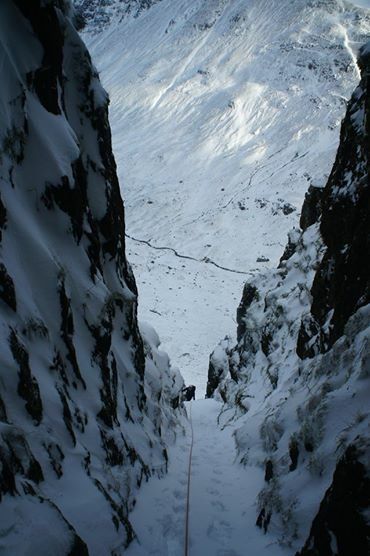 Saturday was spent at Great End climbing Custs Gully. Lots of lead and retreat skills covered… Thanks for running a great course Tom. 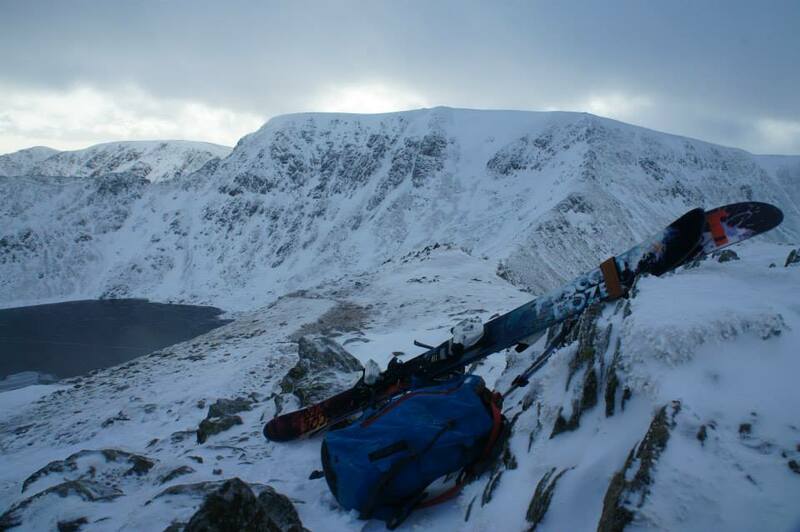 Out with Joe and Highpoint Mountain Guides today for some winter skills and a tour up Helvellyn. 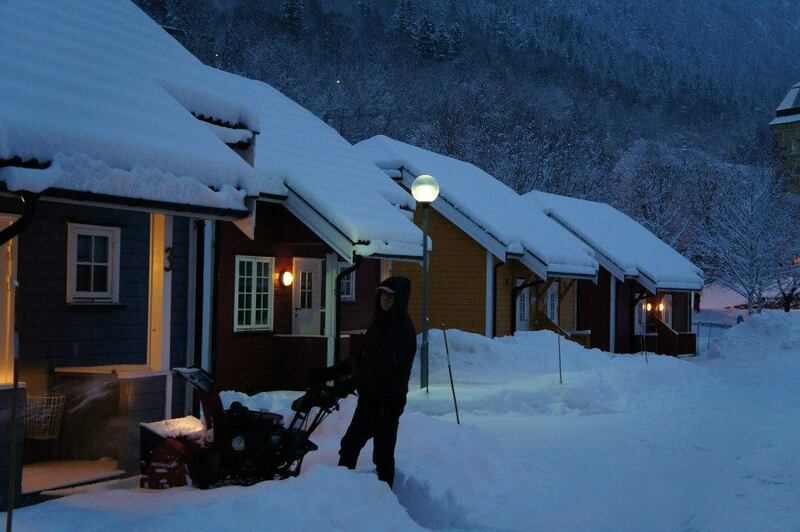 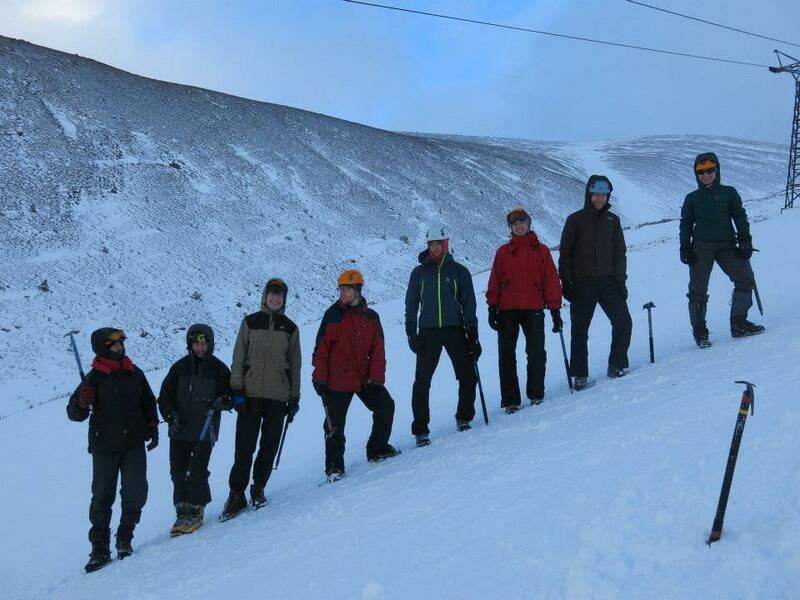 Lots covered with brilliant weather and with good snow conditions and plenty of good banter from the team! 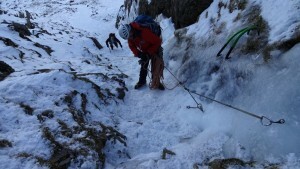 We were looking to climb some ‘Cold Climbs’ classics today so headed for Great End. 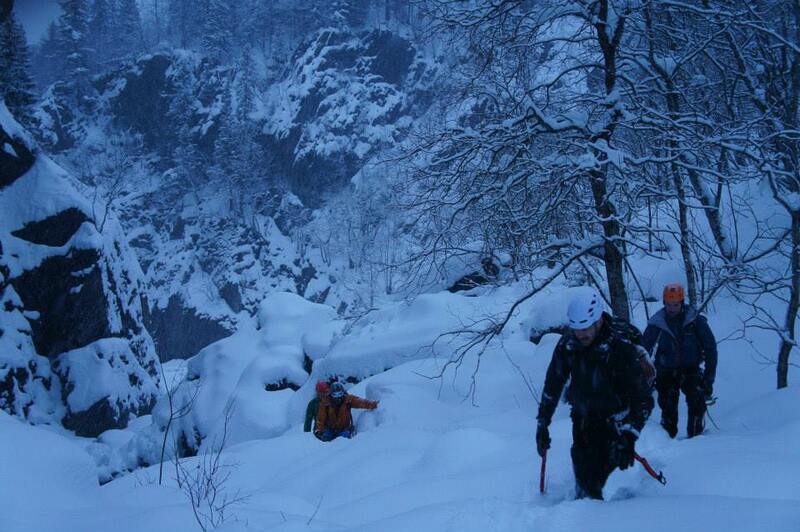 Despite being above freezing the humidity was low and the condition of the routes still really good. There was lots of good ice, good neve and the turf still well frozen. 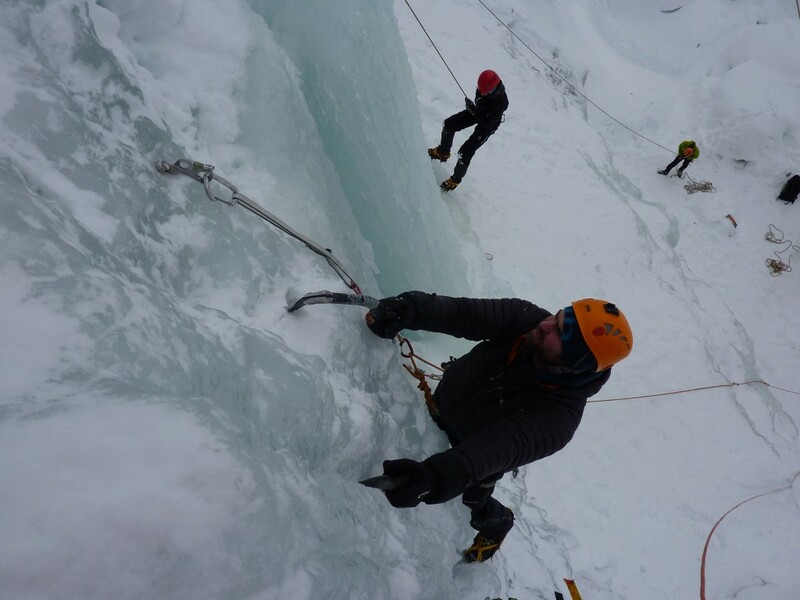 The higher buttresses were also still frosted white for the steeper mixed options up high (Grand Finale etc) We climbed Window Gully with the ice-fall finish which was great followed by Central Gully with the left-hand ice-fall finish, also in brilliant condition. 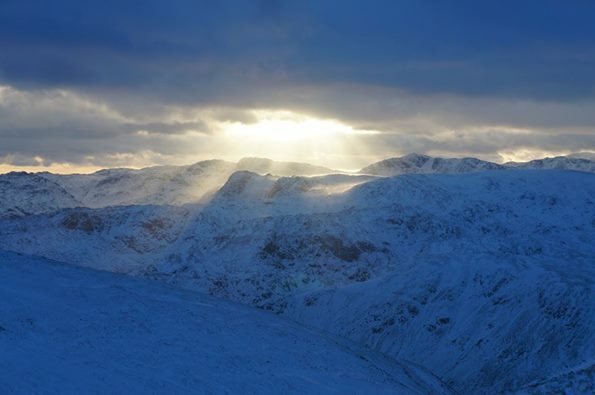 Yet another great winter day out on the Fells! 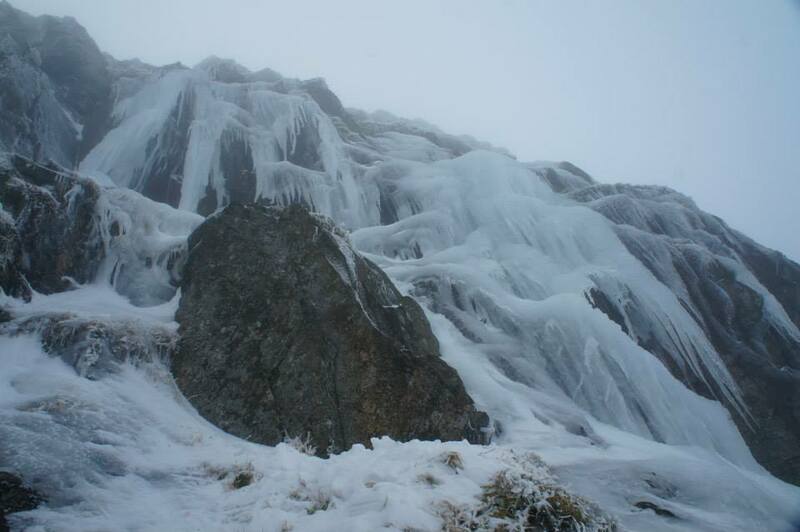 And another great shot from Steve of MovieIt from Helvellyn yesterday showing the brilliant ice conditions! 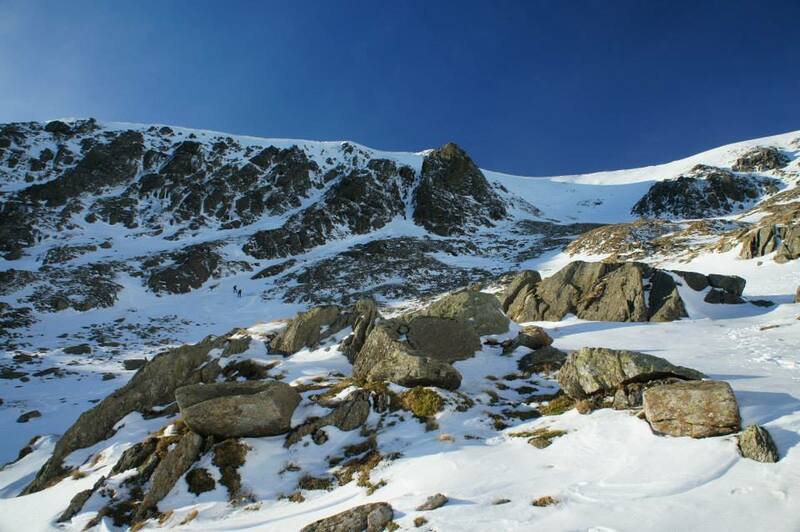 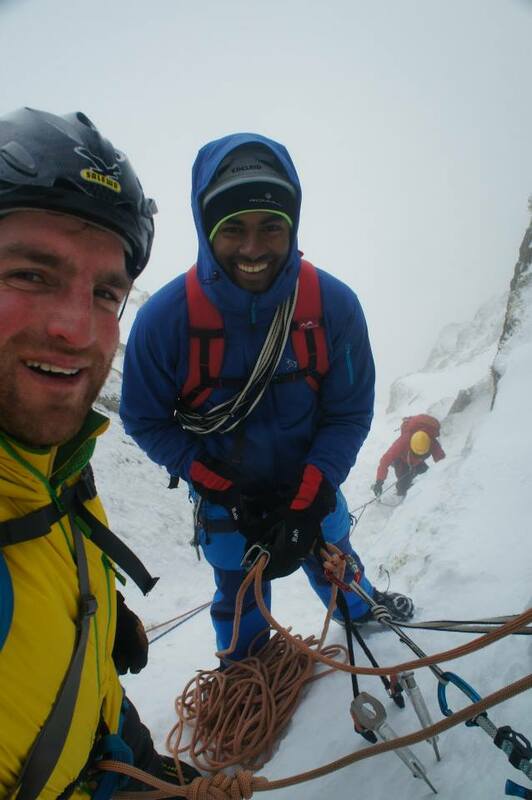 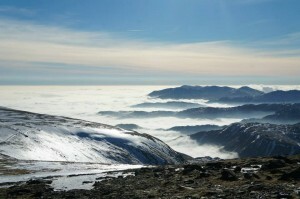 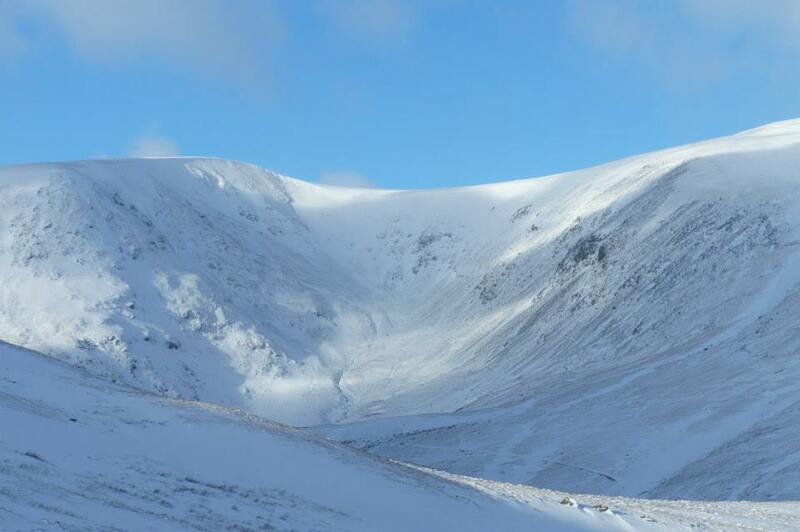 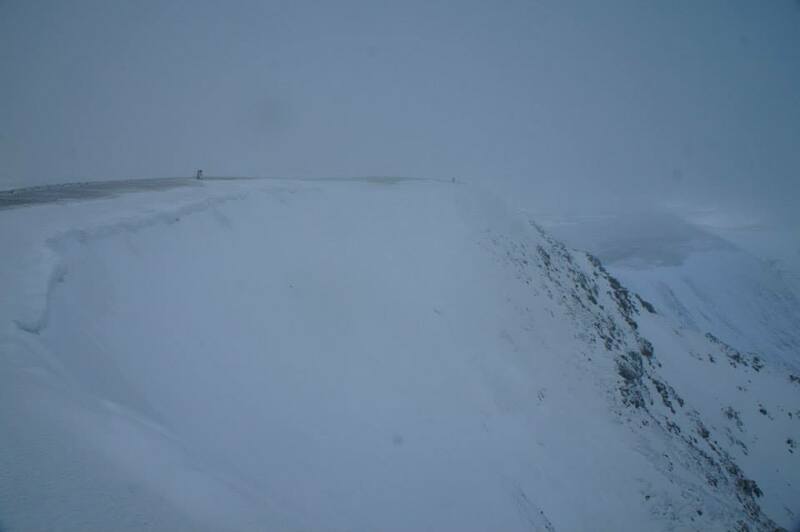 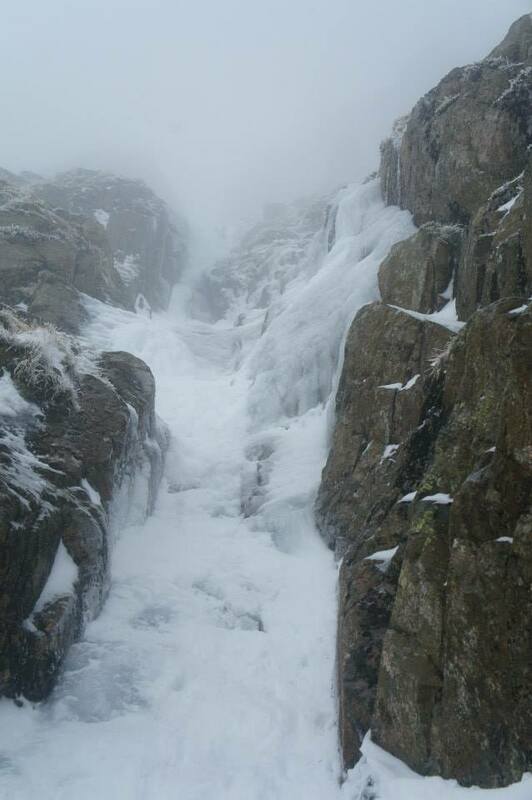 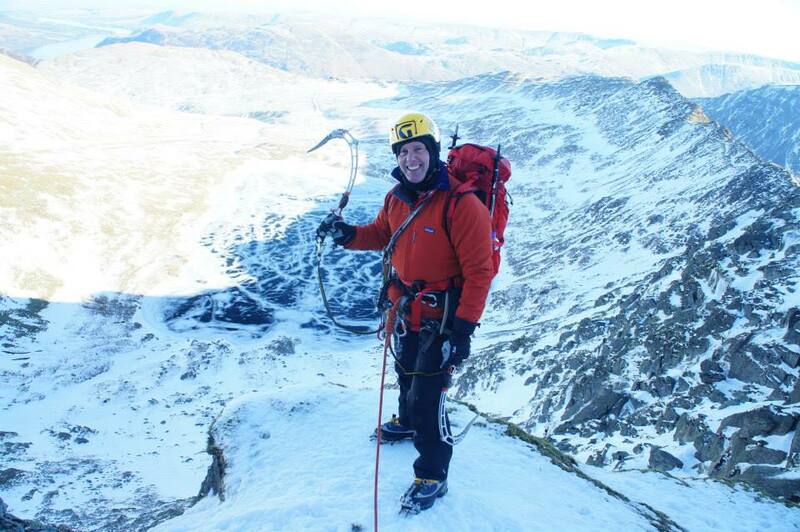 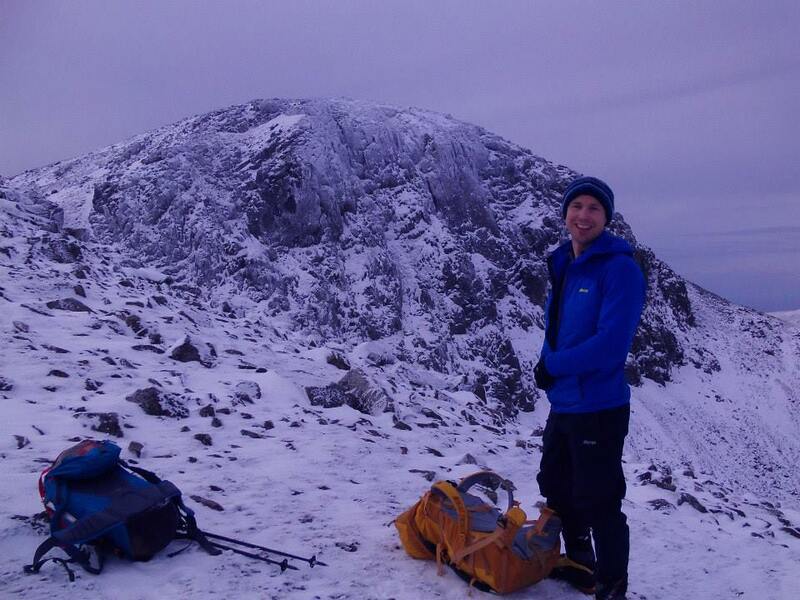 Helvellyn Conditions today… and 2 new routes from yesterday! 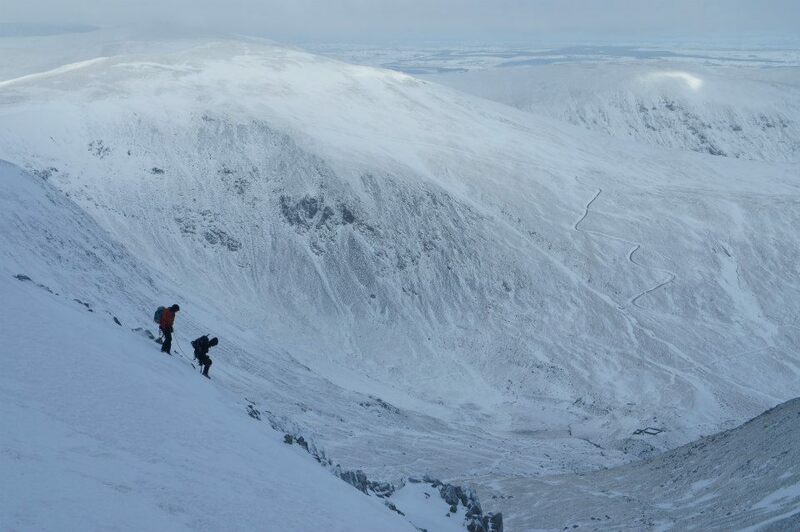 Great day out with perfect weather and conditions on Helvellyn. 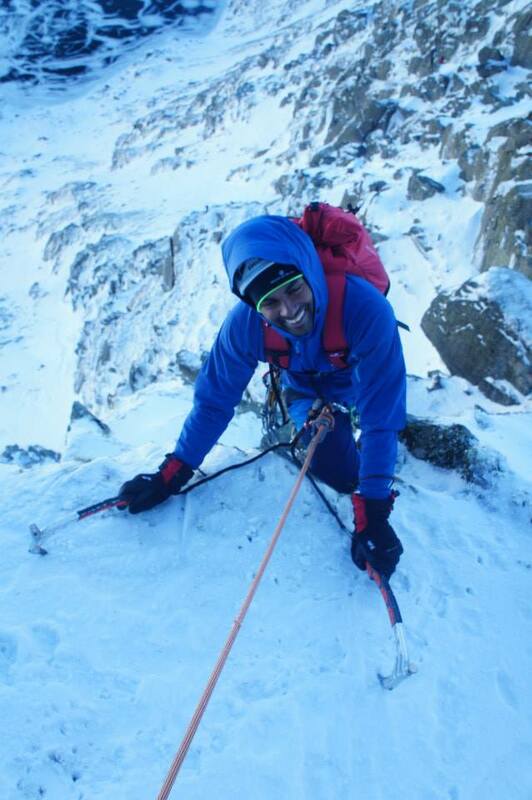 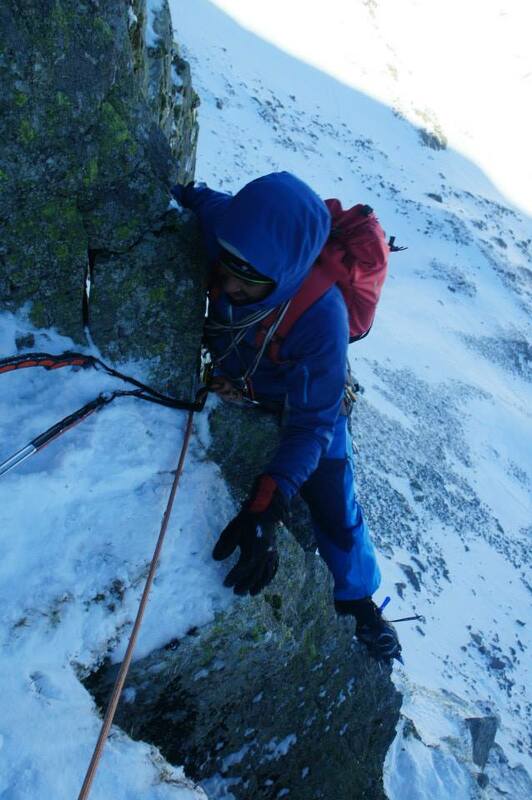 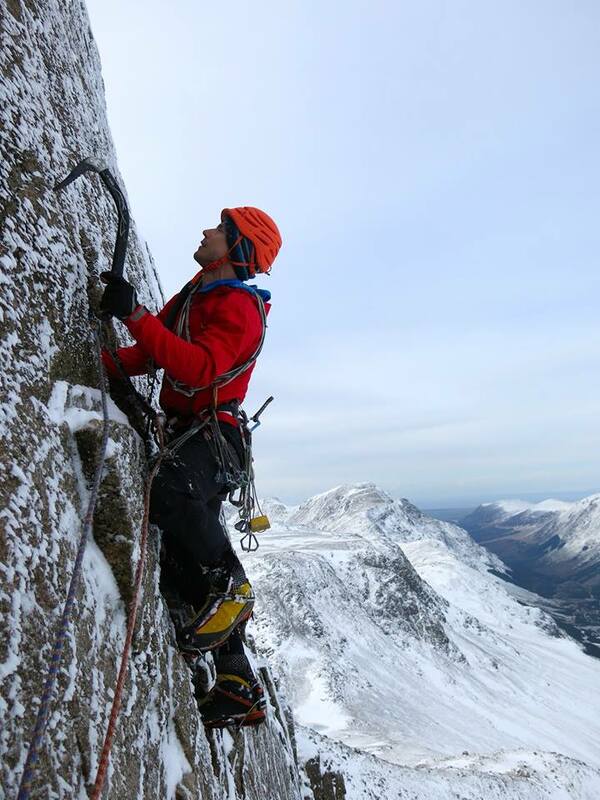 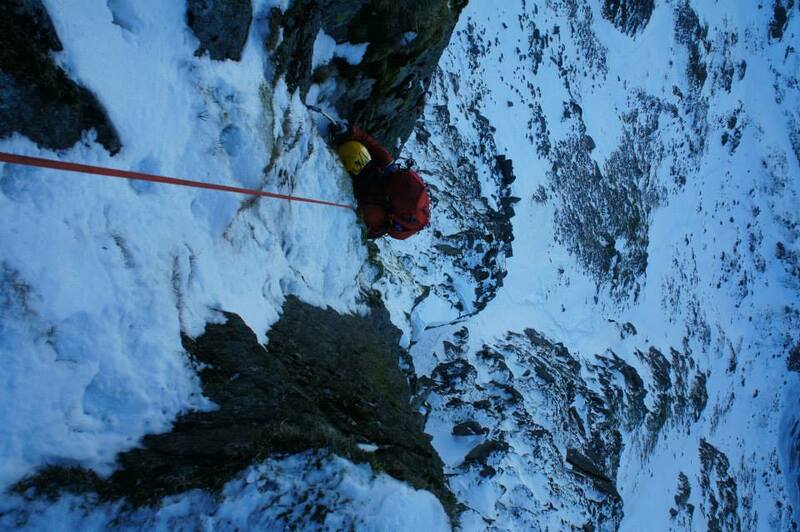 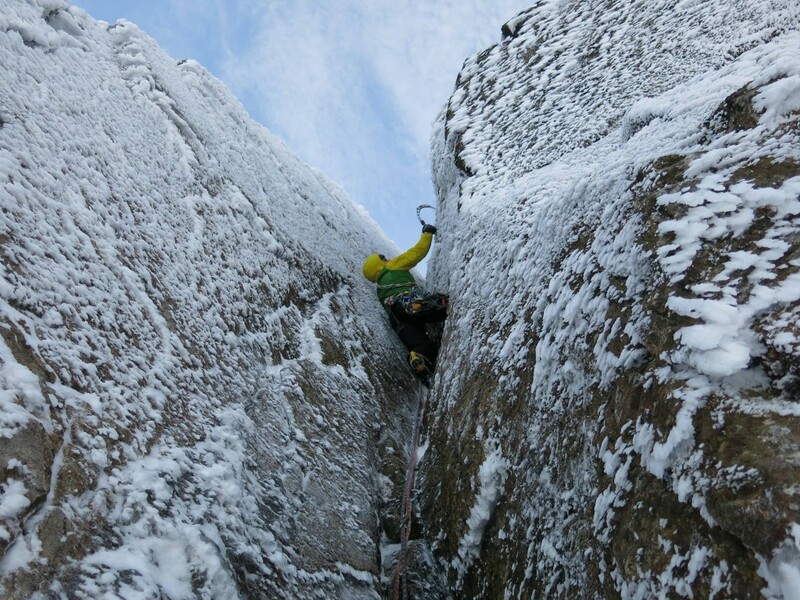 Avi was keen to get some mileage done at about grade 4 so we climbed Viking Buttress with the Loki start and Arete finish, the route was in great condition with neve, ice in places I’ve never seen ice on there, and the turf was like concrete! 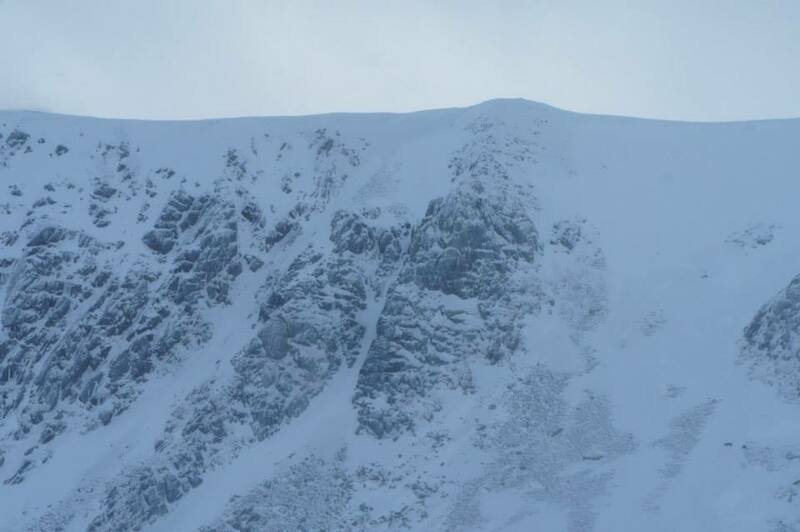 The steeper mixed routes which don’t hold snow are stripped though due to all the sun we have been getting. 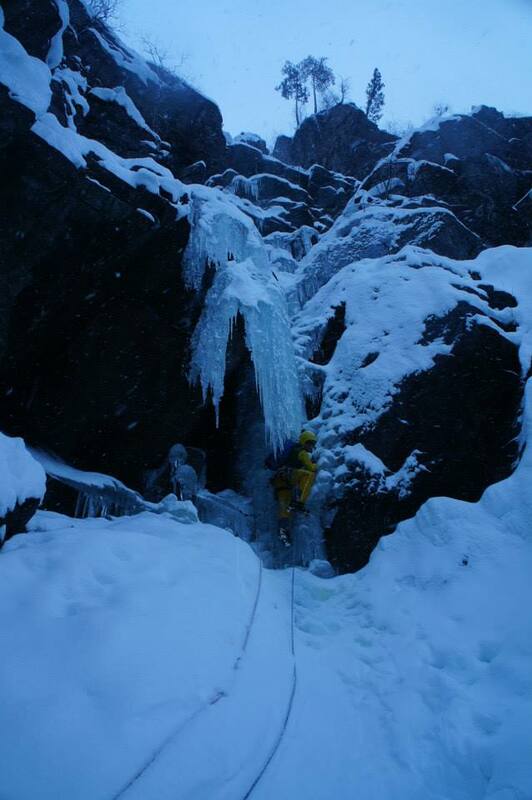 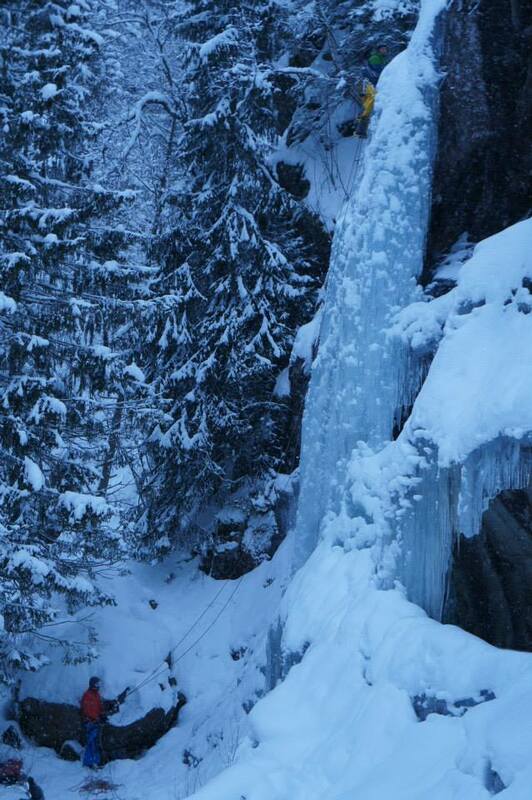 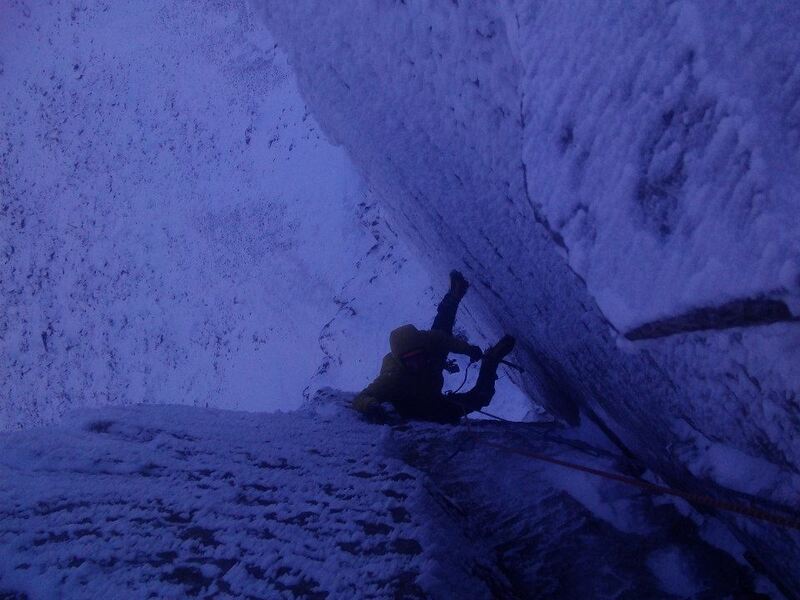 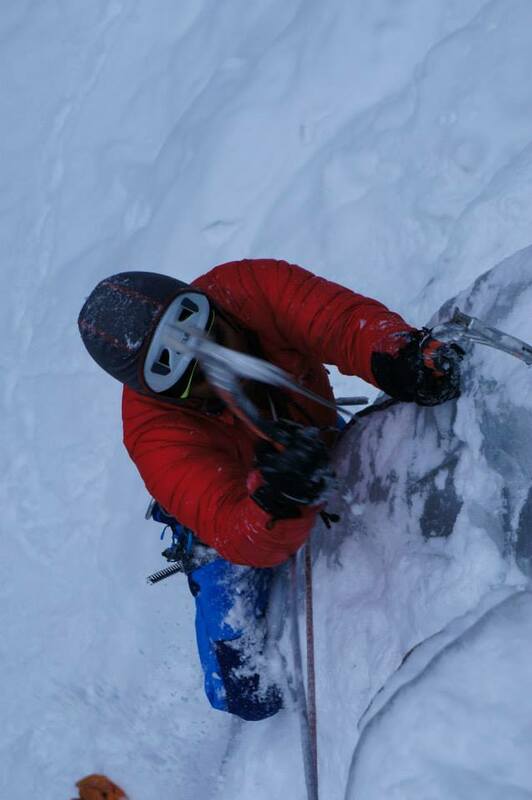 We then climbed V-Corner with 2 pitches up great little ice-falls to start out left, one a free standing pillar. 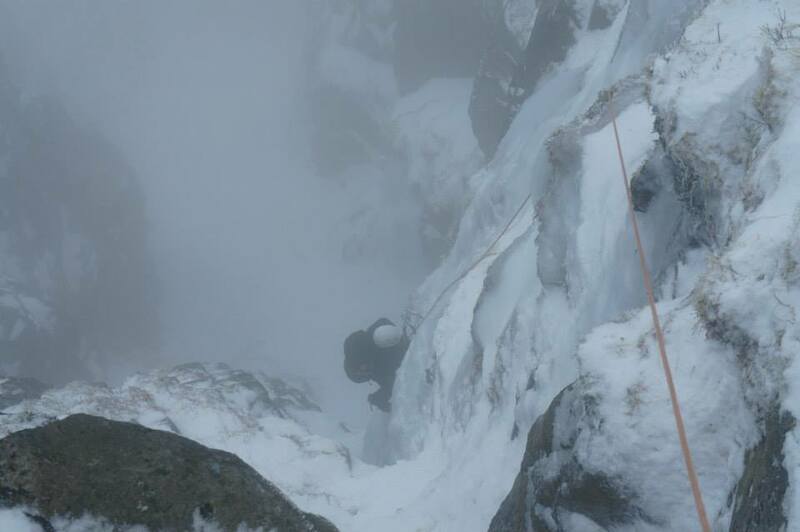 Another great day out in brilliant conditions! Yesterday I was out with Steve from MovieIt to check out a couple of steep ice-falls he had spotted on one of his many scouting missions around the back of Langdale. 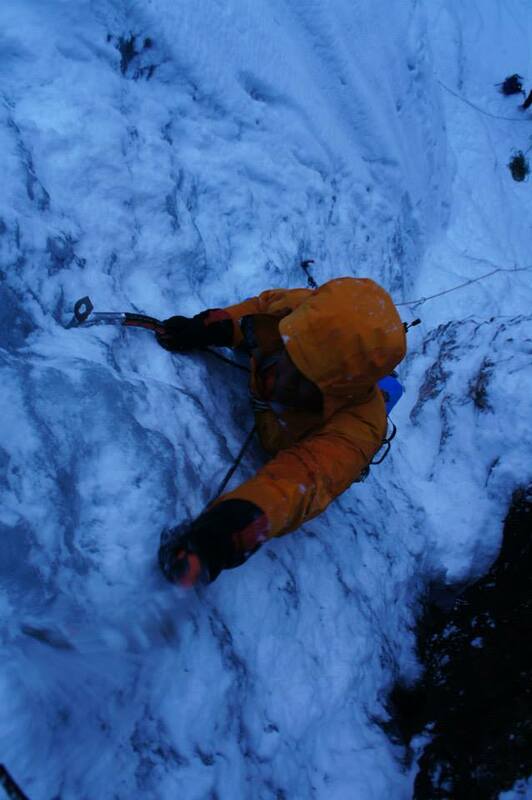 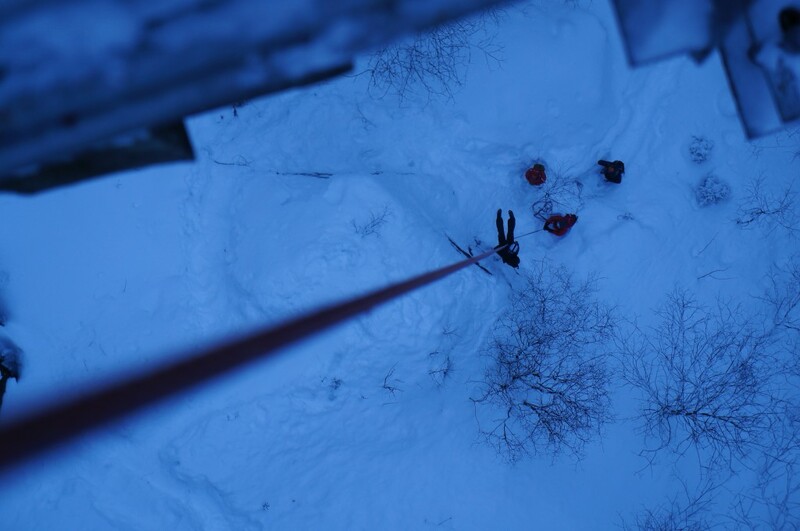 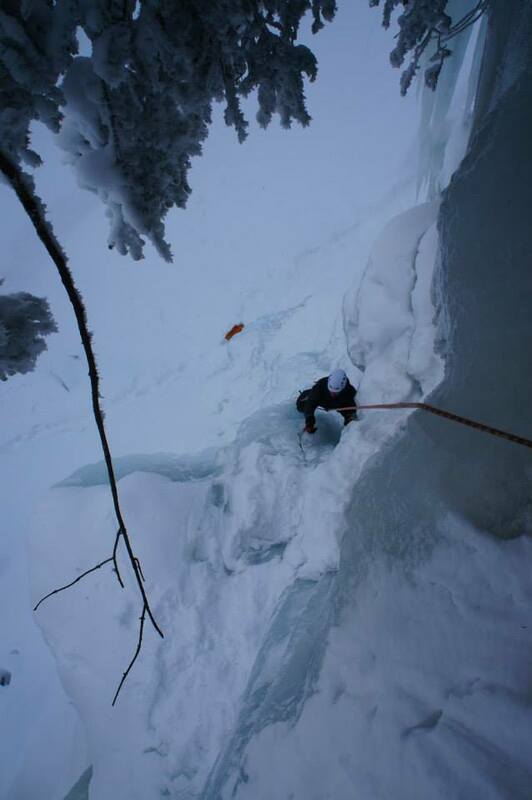 We climbed 2 new winter only routes on there, both great, one a steep thin ice-fall with an interesting thin icy corner to start, about V/5 maybe. 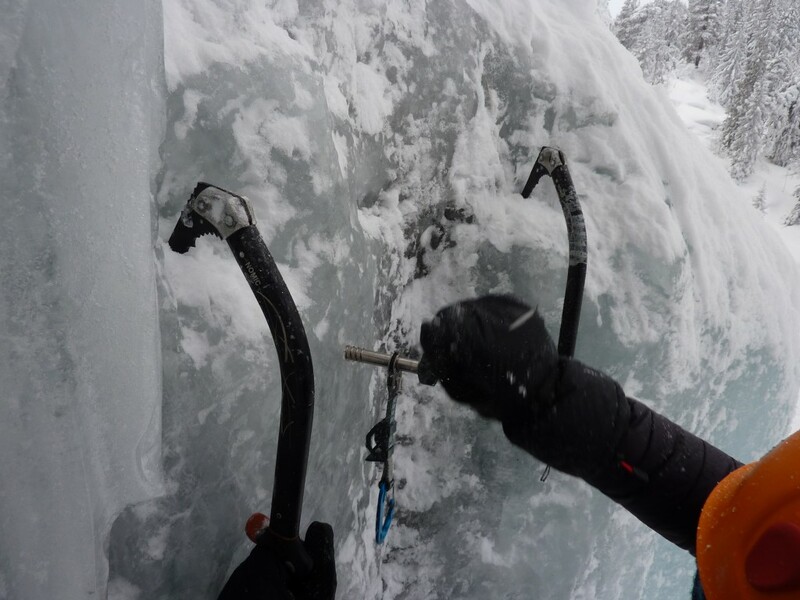 The first route we did was much harder and took on and iced overhanging wall on poor gear followed by a committing ice fringe, then more thin ice and another roof with icicles to finish. 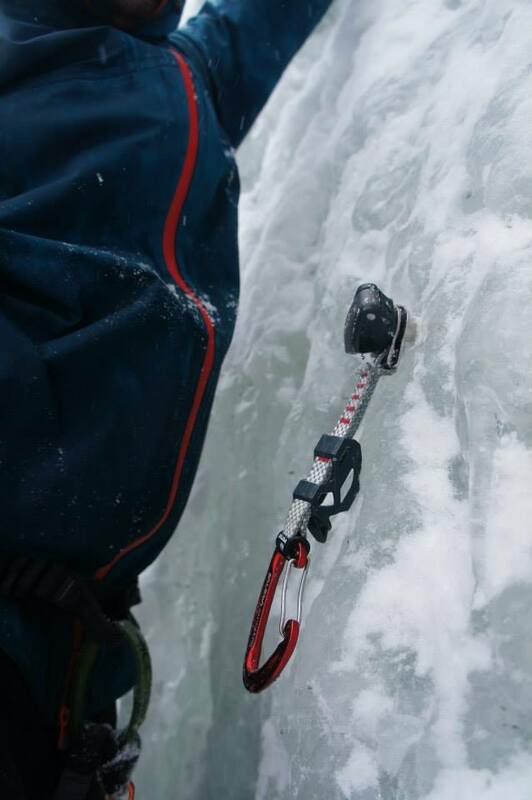 A great pitch and good challenge! 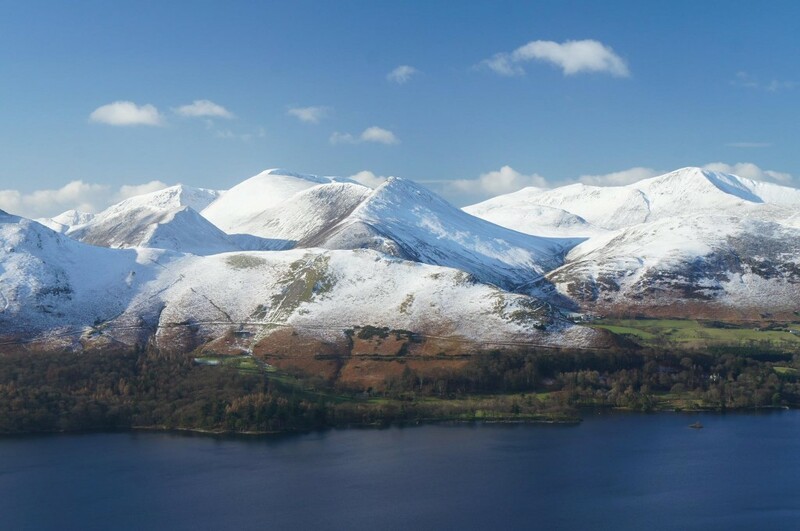 The last few days in the Lakes have given some great winter conditions and brilliant weather! 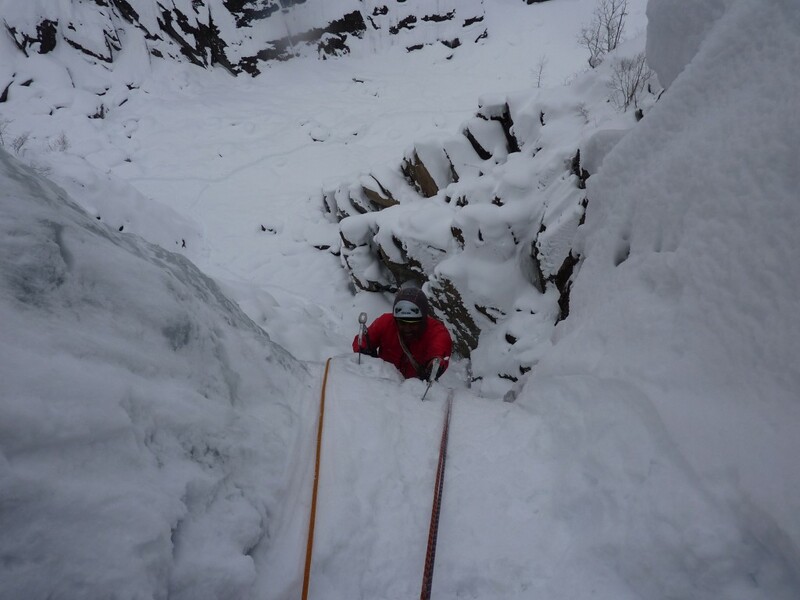 3 days ago we did Chock Gully which was in OK condition with good snow ice, some hollow/thin section though as well. 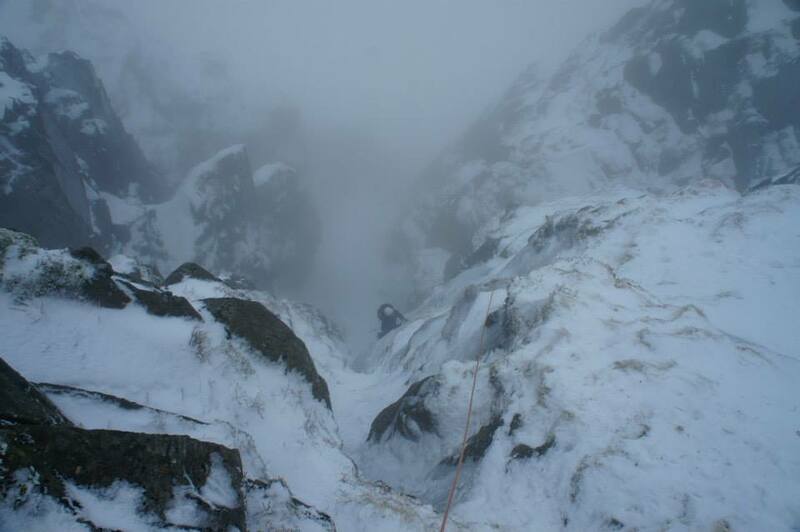 Today we did Engineers Slabs on Gable Crag, the whole crag was in great condition for steep mixed climbing, turf solid and well frosted up! Scafell Crag looked really good too. 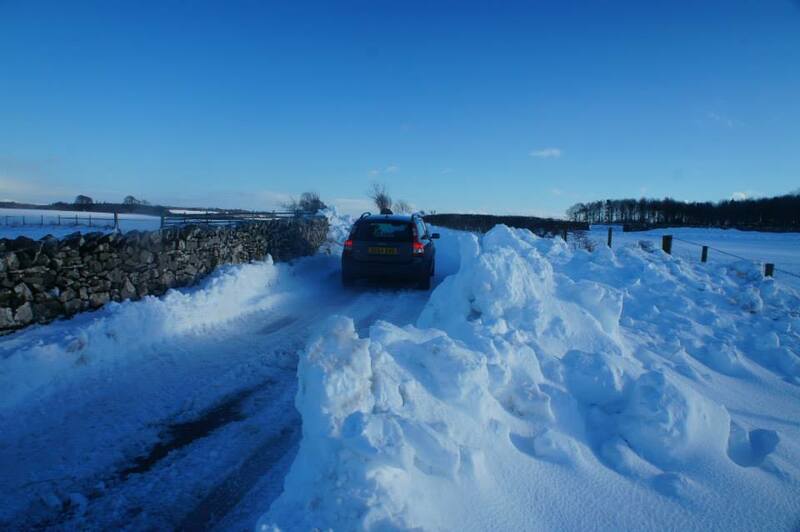 Its set to continue for a few days so get out if you can! 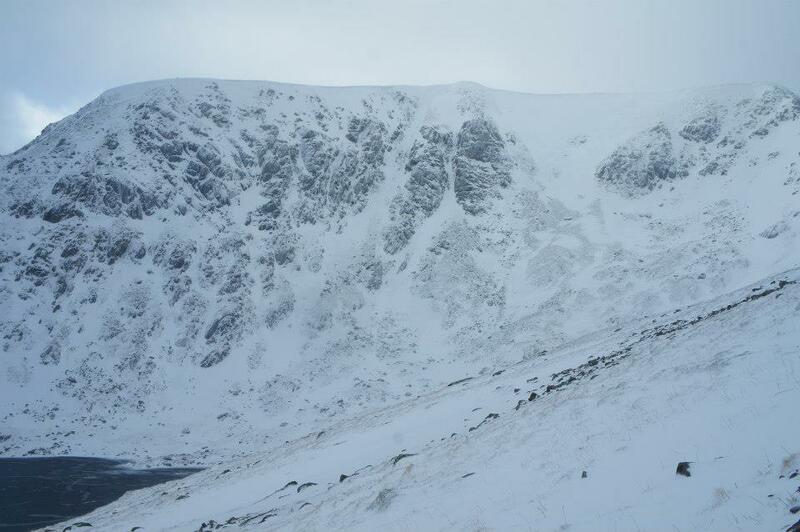 Some shots from Red Tarn basin today. 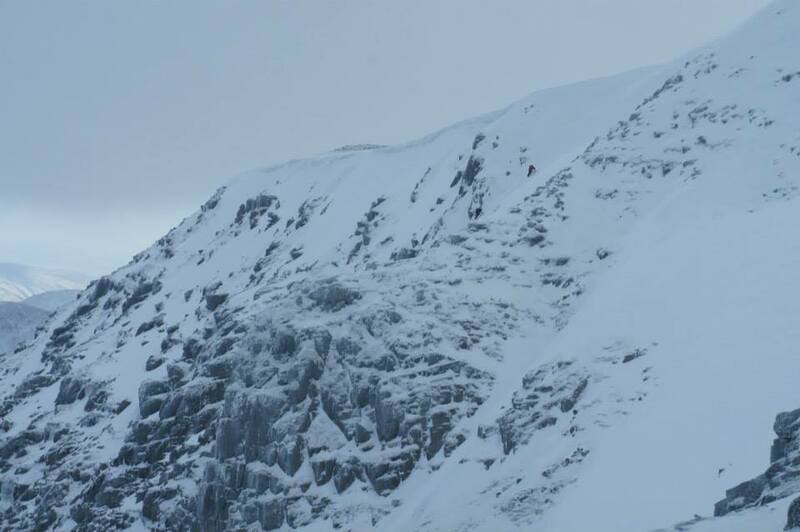 Some fresh pillows of wind-slab to watch out for but mainly hard scoured neve, still windy though so snow being transported. 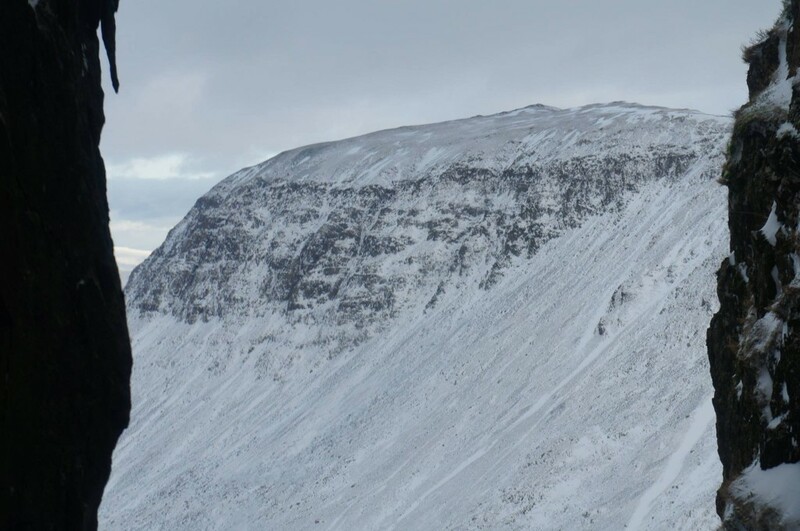 Most fresh accumulation is on SE facing slopes. 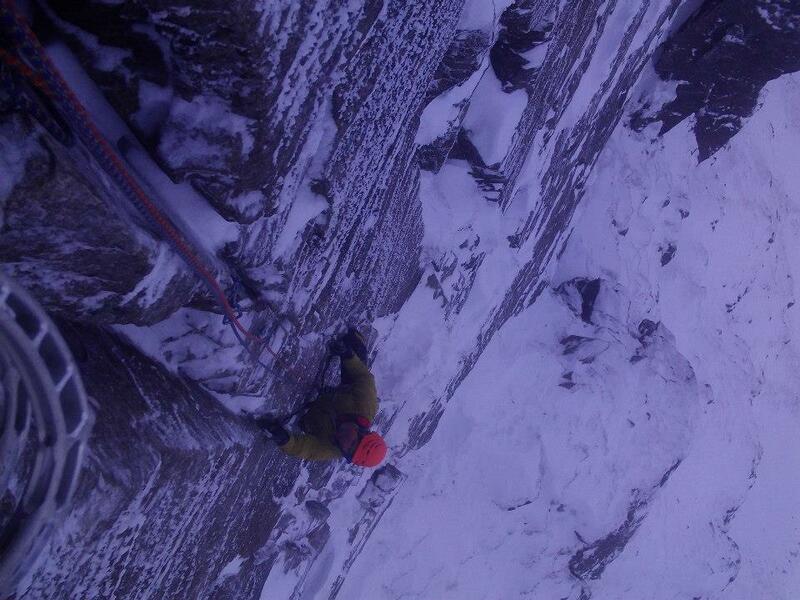 Gullies looked great and were climbed by a few. 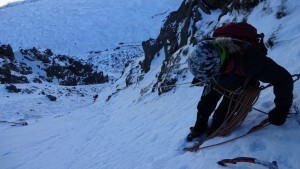 Buttresses looked snowed up and good, exposed turf seemed frozen, wasn’t climbing so couldn’t say for sure on that one! 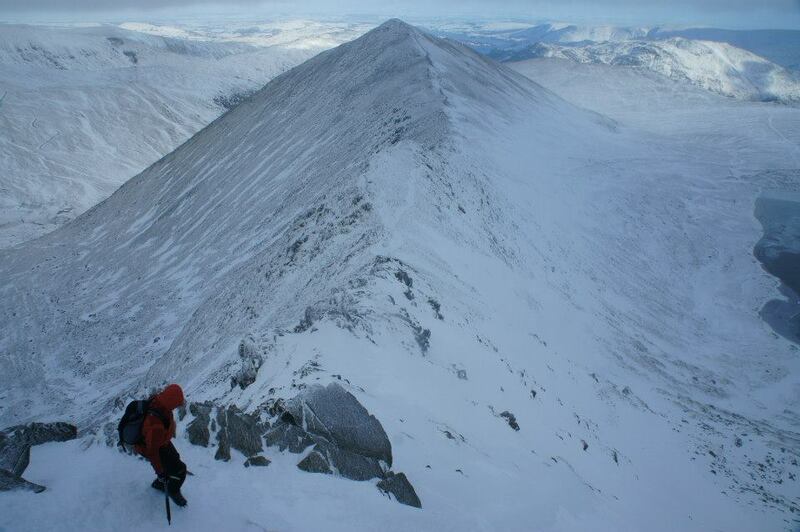 The edges were scoured and icy, especially Swirral, most will want crampons on for this, particularly the top section. 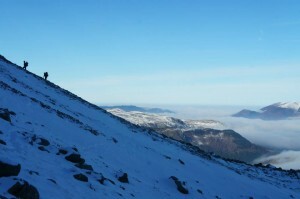 All in all a really nice winter day with great views and sunshine! 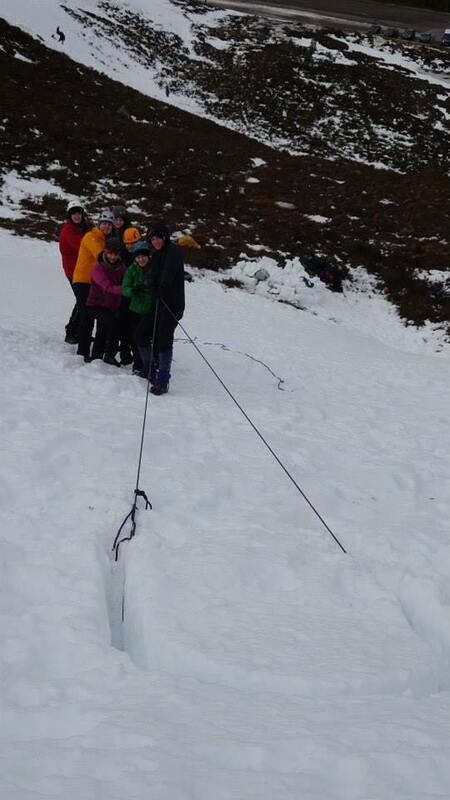 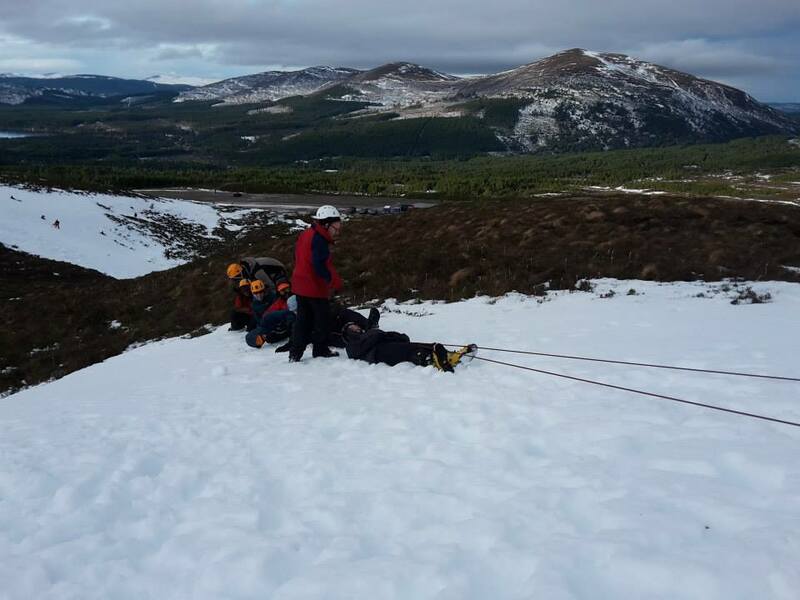 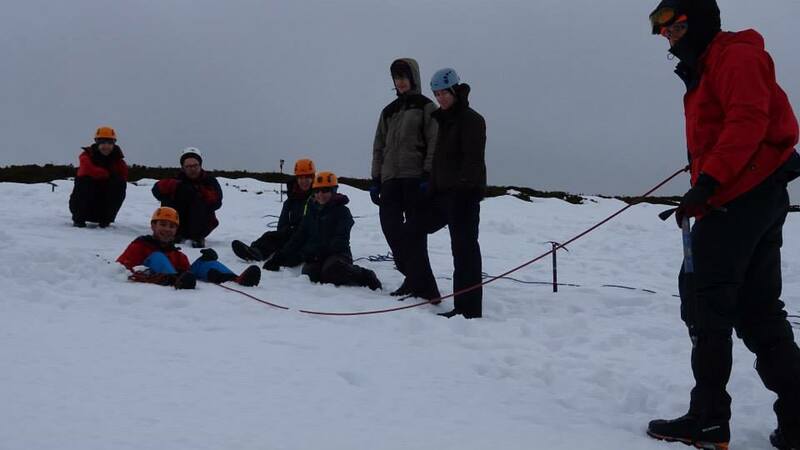 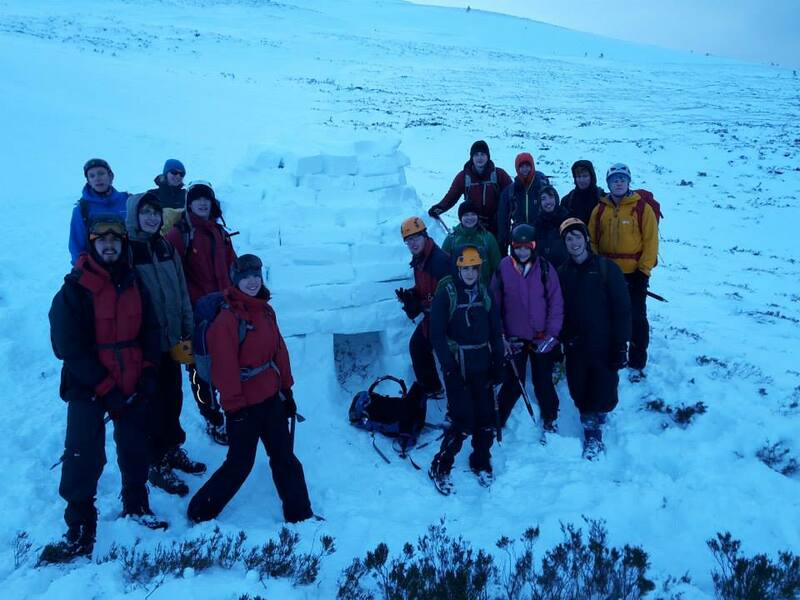 16 students from Lancaster Uni joined us for a winter skills weekend in the Cairngorms. 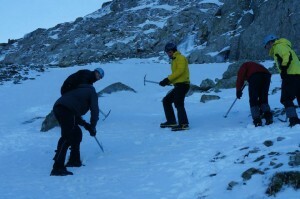 Lots of skills were covered over the 2 days by a very keen group! 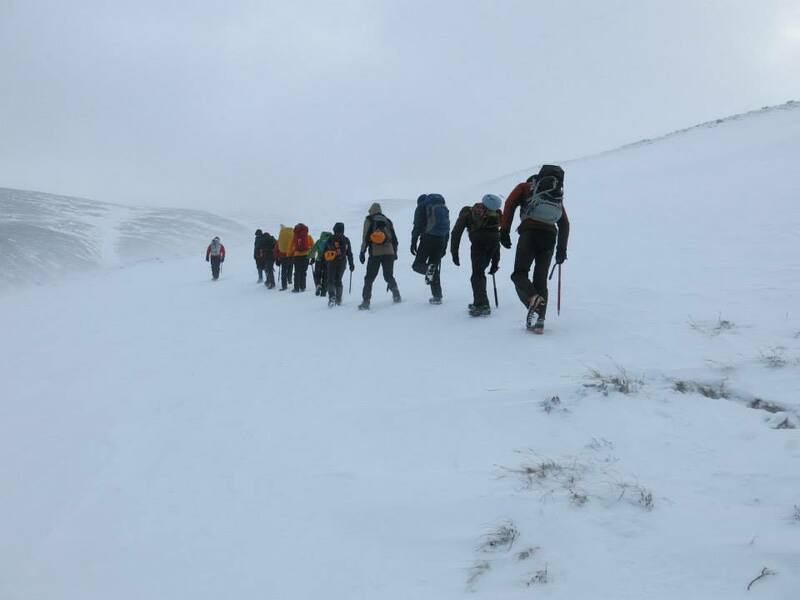 The weather was wild at times but everyone got stuck in, well done to all… Thanks to Tom and Alex for running a great course! 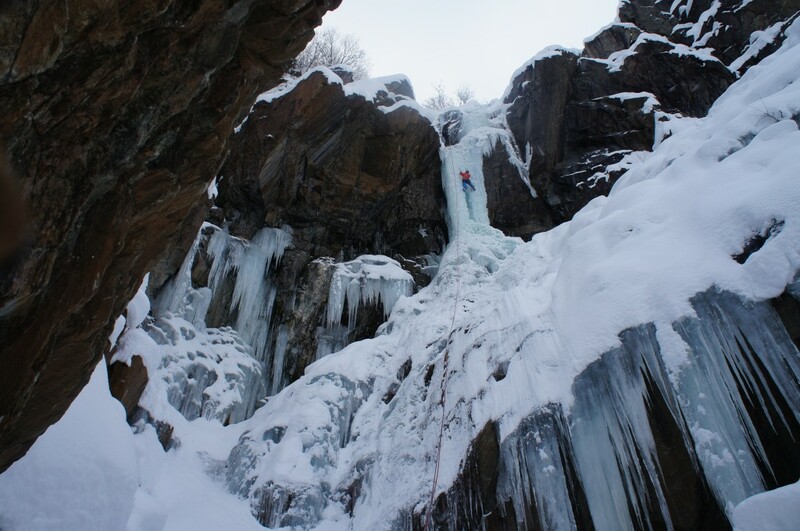 For our last day in Norway we headed to Krokan again, with a range of things we wanted to do Krokan was ideal and after all the snow the routes there were cleared of snow and well tracked on the approaches. 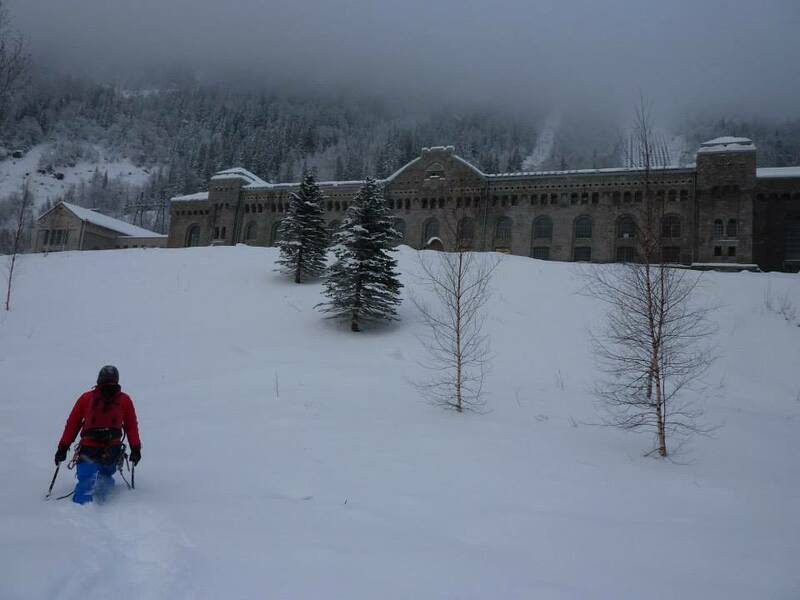 Some places are really deep in powder currently so getting about on untracked snow is tough going. 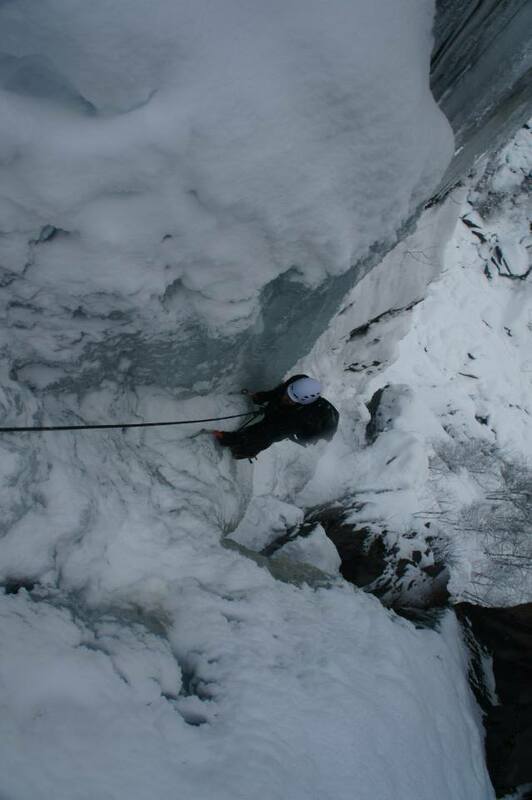 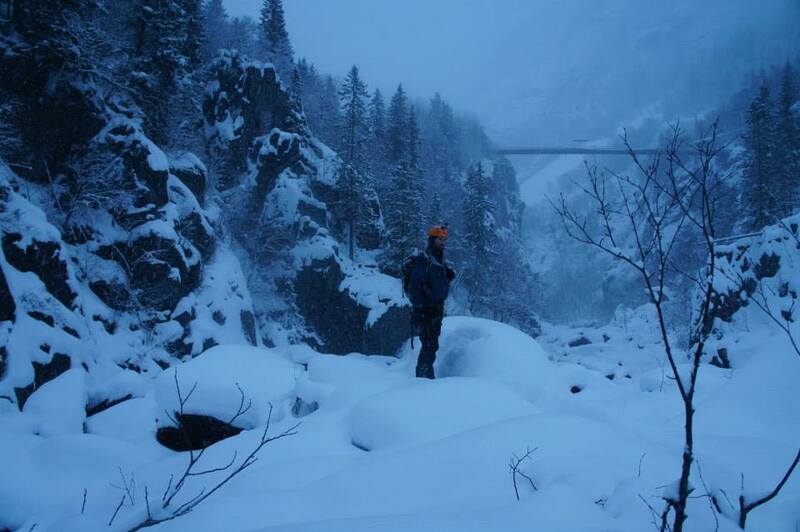 We did see people on Trappfoss so there must be a track in the Upper Gorge now and the route will be clear of snow. 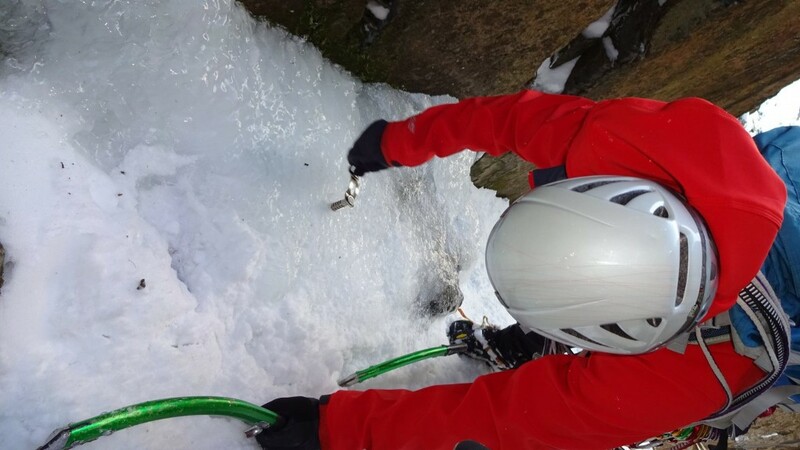 Today we covered various skills, more leading practice, some nice routes we didn’t do when in at the start of the week and then finished up with some steep dry tooling and hanging icicles. 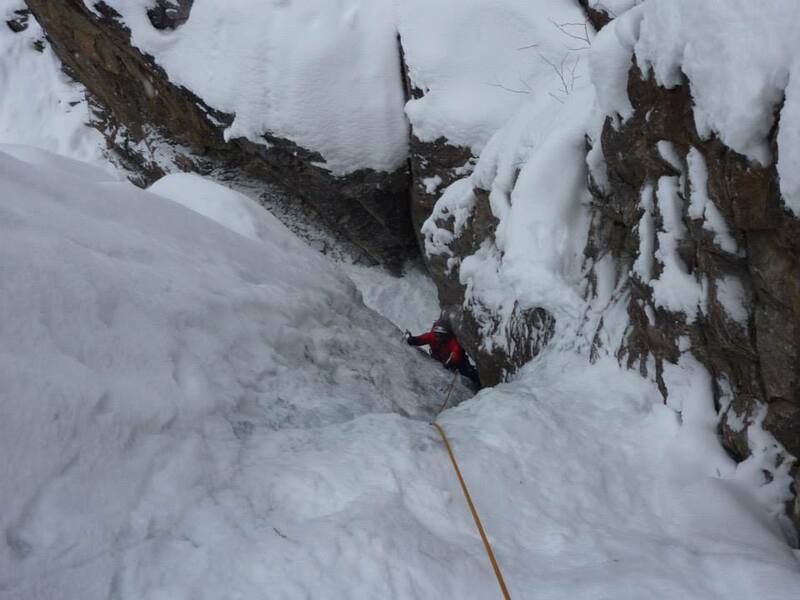 This was the only real mixed route we did all week and it was something a bit different for everyone to have a go at. 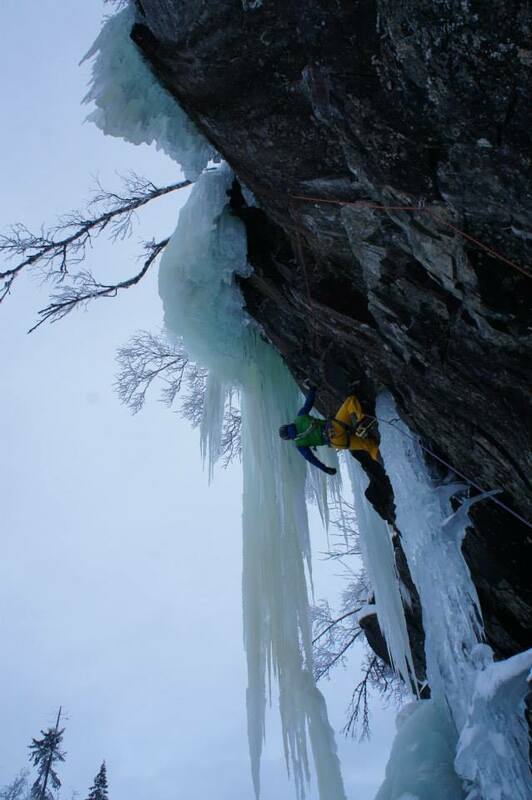 Another great day and the end of a brilliant week course in Norway. 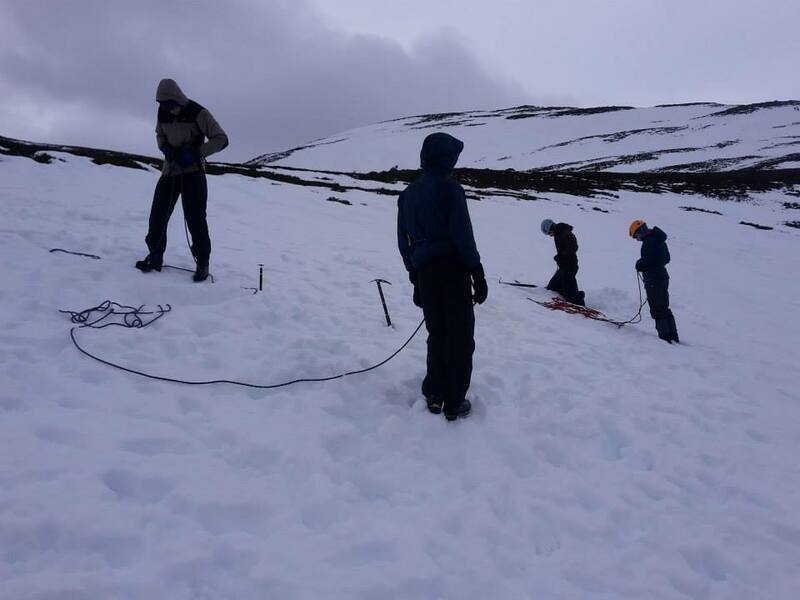 Thanks to all the team! 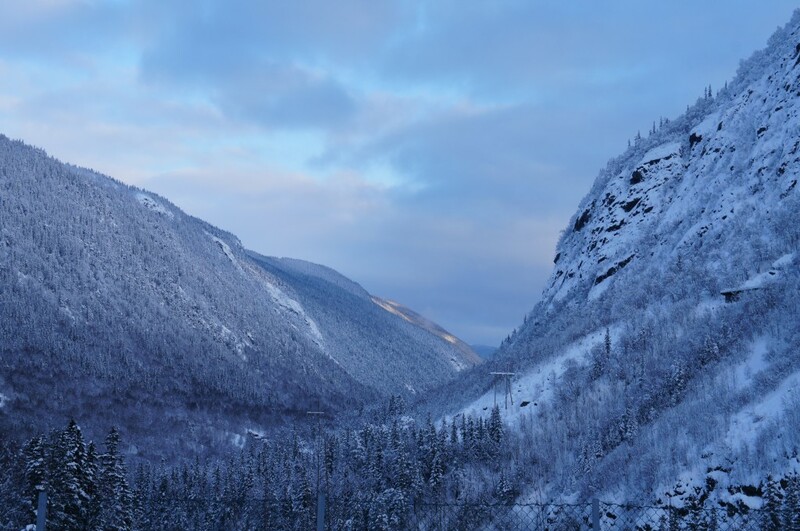 The snow stopped today and the temperatures dropped a bit more to give some really nice cold dry conditions and views of the hills and forests covered in fresh snow. 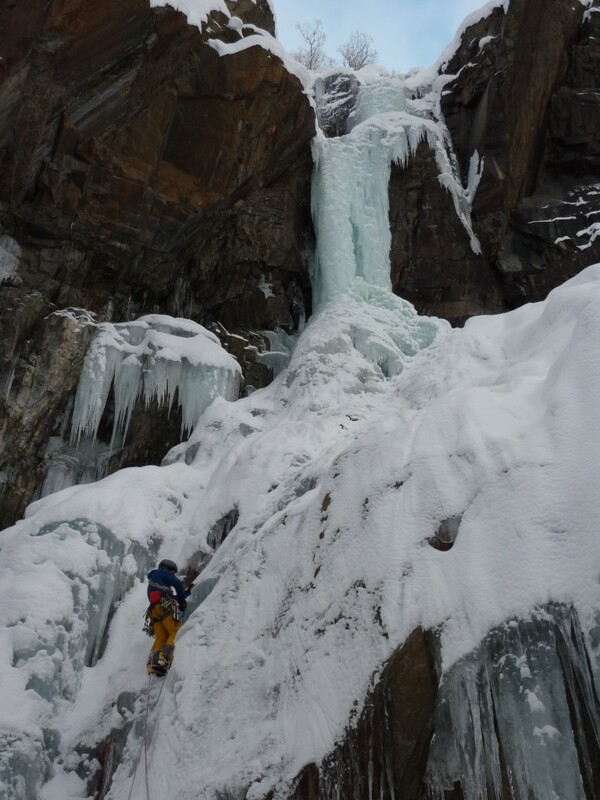 We wanted some mileage on routes we thought would be cleared of snow or steep enough to shed it, both our teams climbed a WI5 called Nye Vemorkfoss which was great and then abbed off. 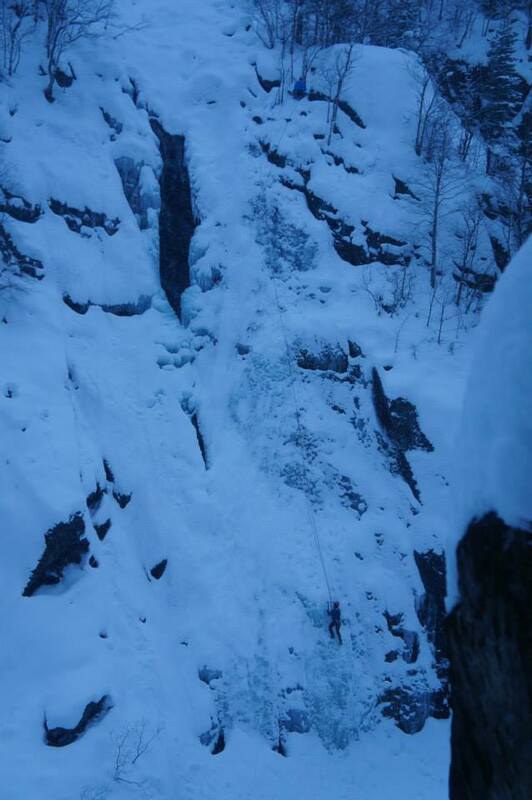 Derek, Pete and myself then did the brilliant Bakveien, the hidden pitch was complete and the route in good but thin condition, very Scottish in character… Mark and Avi headed to Nedre Svingfoss which was also good and cleared of snow after many ascents. 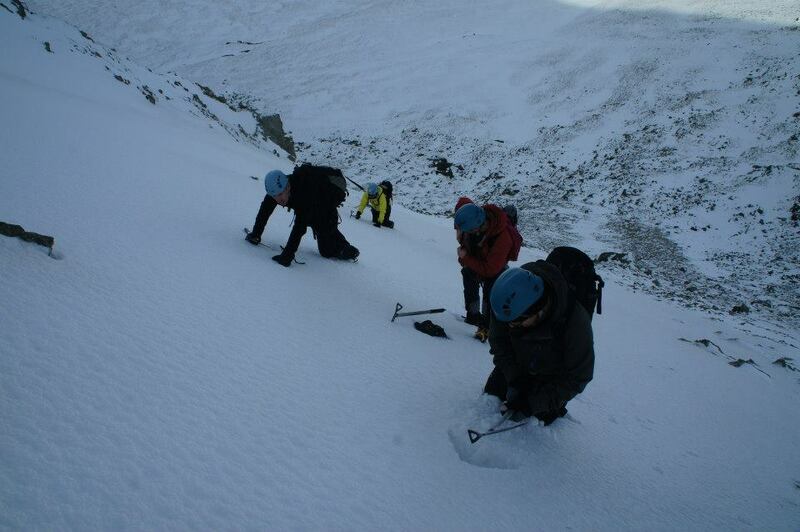 After a very snowy start we headed for the Ozzimosis area today for some focused leading instruction. All the team lead a number of routes up to WI3 with lots of focus on technique and placing ice screws. 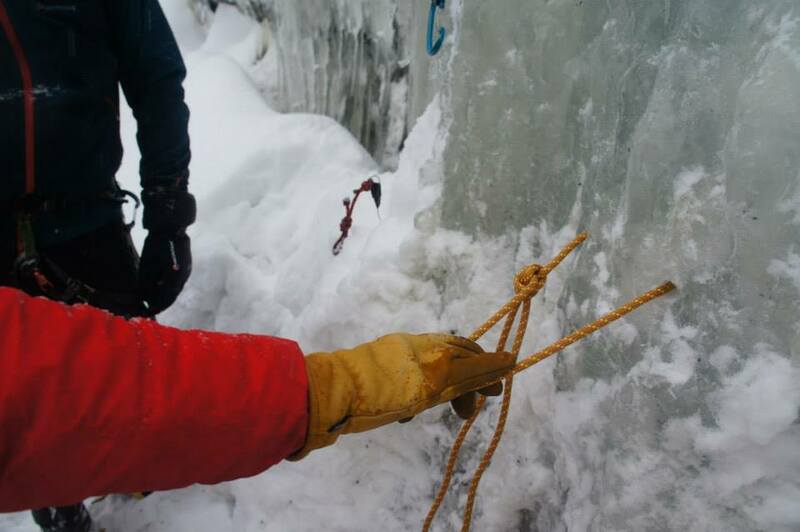 We also made some ice threads and looked at the retreat procedure for escaping a route. 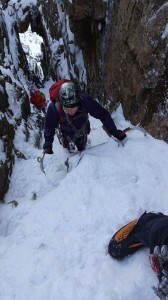 All the routes were in good condition including the classic of the area, Ozzimosis WI4. 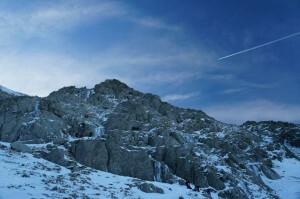 7 routes climbed in total and another great day out! 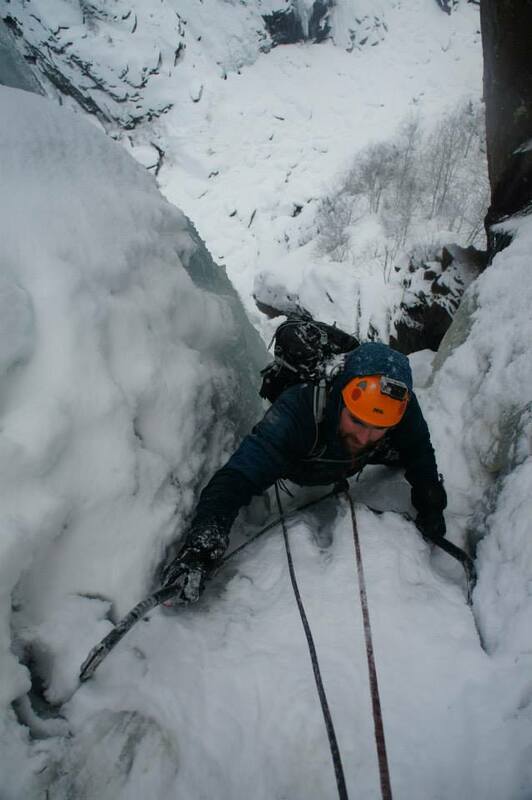 Derek, Pete and myself headed for the Rjukan classic Sabotorfossen today, the route was in good condition but with some variable ice on the top pitch. 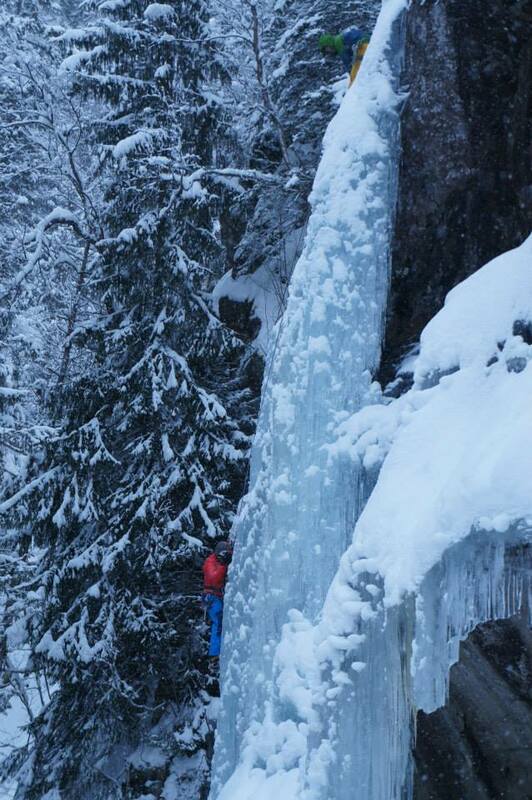 This 3 star classic did not disappoint! It snowed last night and today so plenty of snow about but tracks in to most of the popular areas. 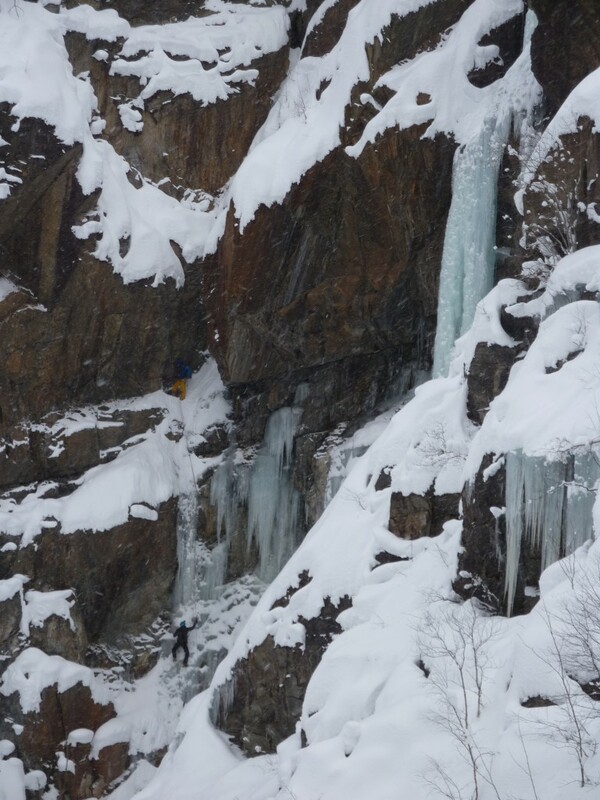 Others were climbing Nedre Svingfoss which looked good and was cleared of snow (this is the problem with a lot of the easy angled routes now). 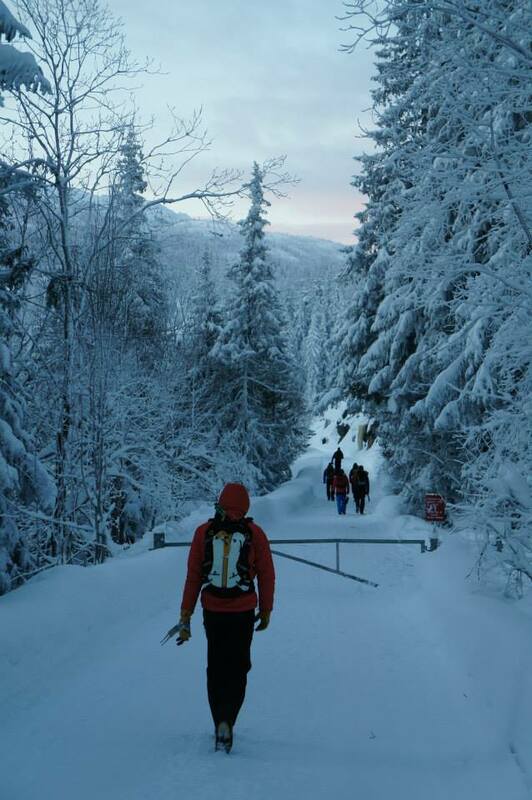 Mark and Avi headed to Bakveien which they reported to be thin but very good. 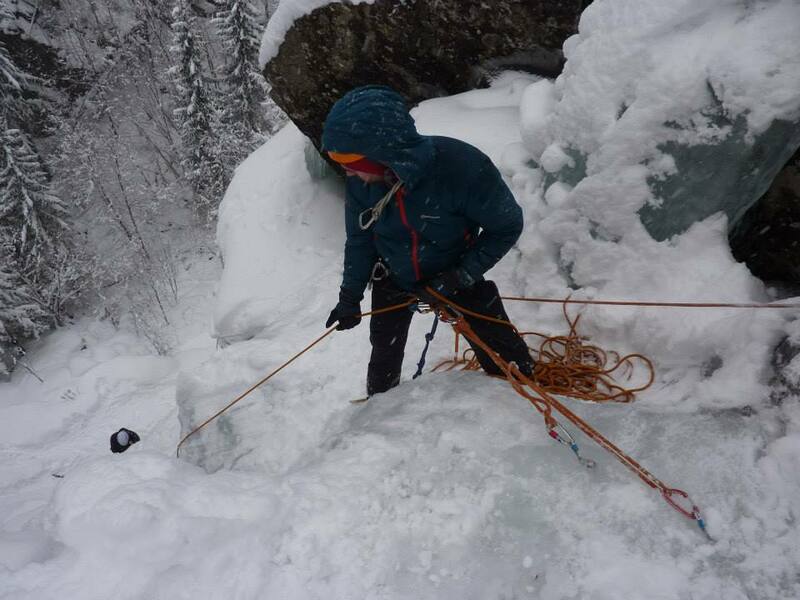 We then all met up and headed to Svingfoss to look at some ice threads and placing screws to pave the way for some leading practice tomorrow..
Mark and Avi headed to Bakveien which they said was a really great route and in good condition. 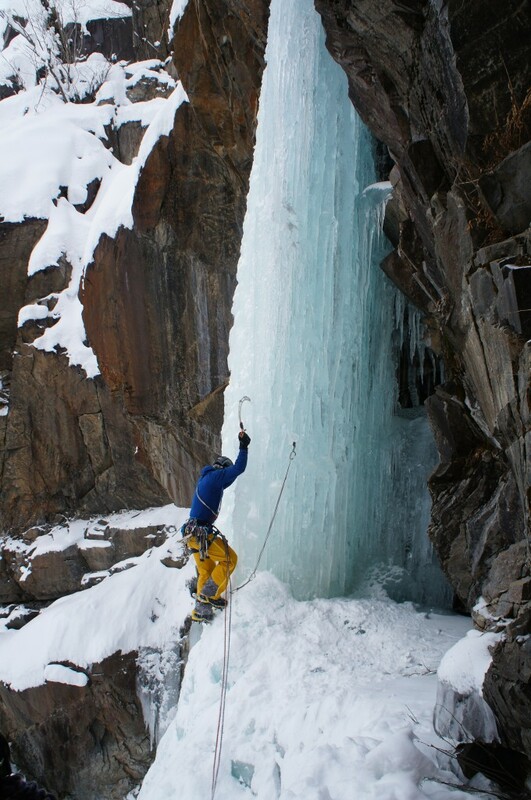 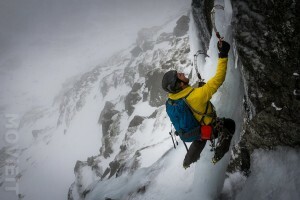 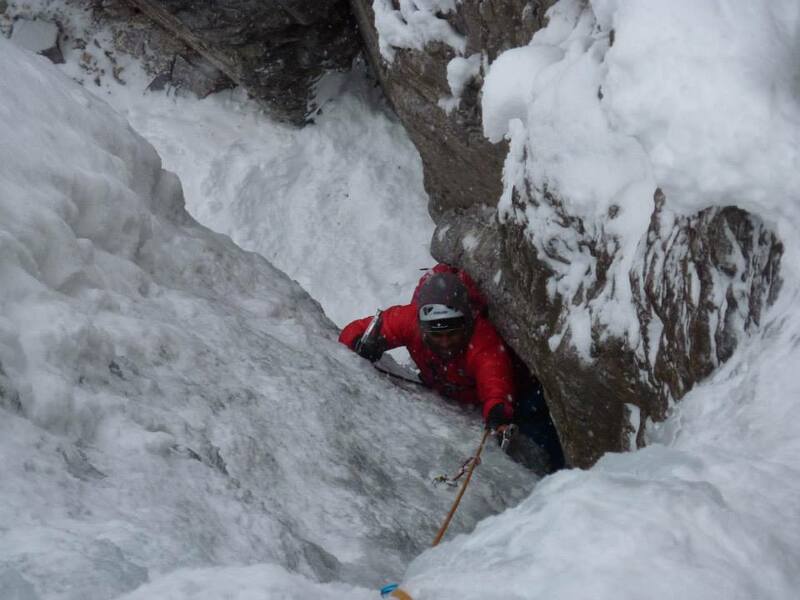 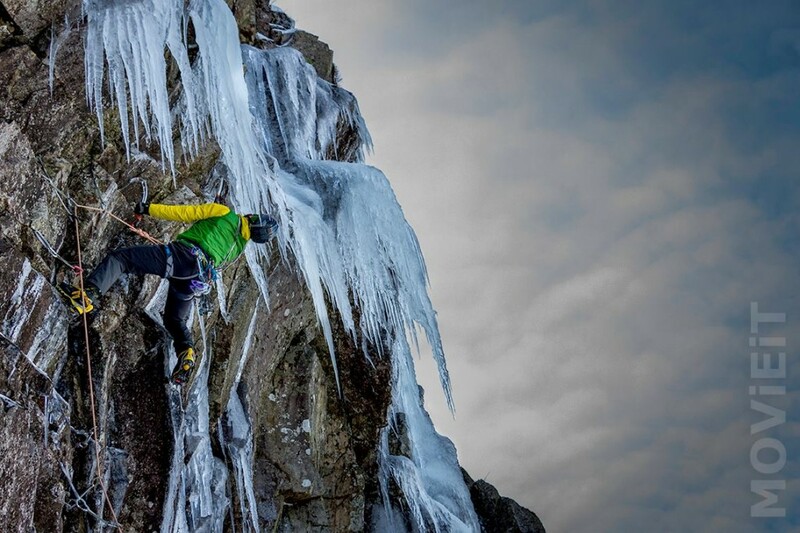 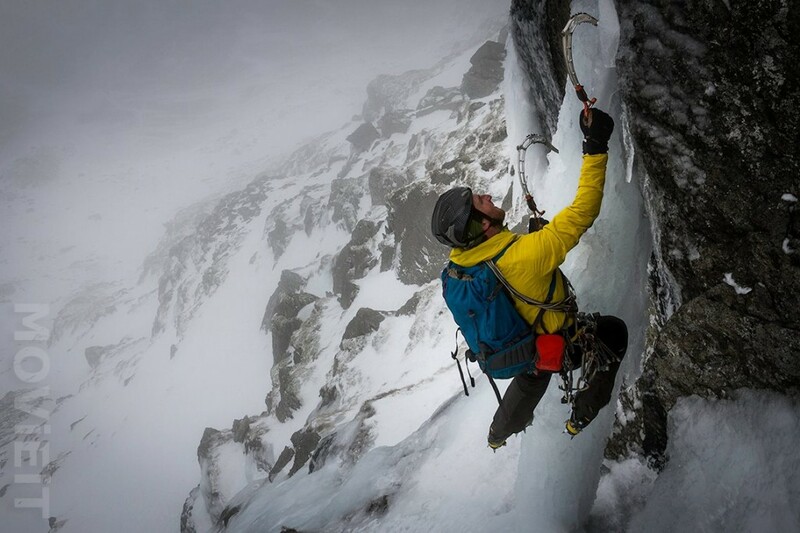 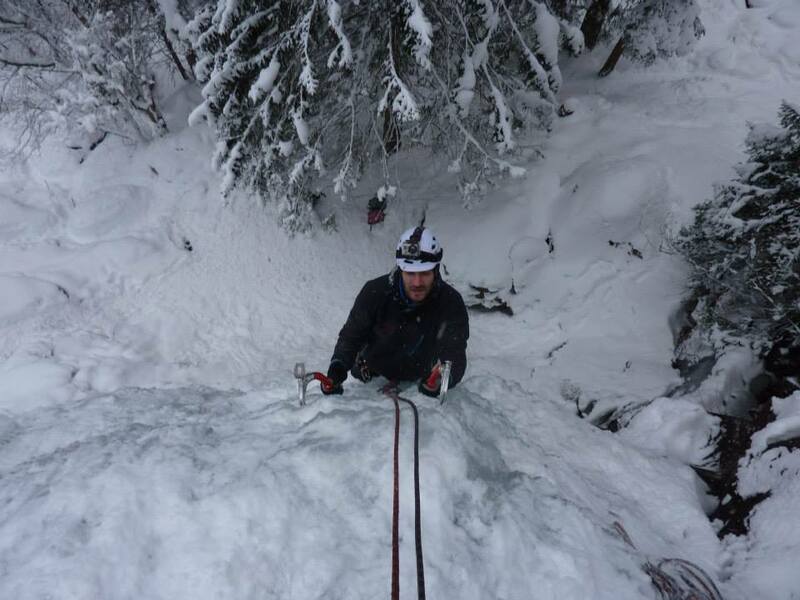 It has varied pitches with technical ice climbing and mixed ground.